In September, there was a sign-up sheet in the break room at work for a pumpkin decorating contest. I signed up even though I'd not done any kind of pumpkin carving or anything in years. I had no ideas at first and originally had decided to paint my pumpkin as Spock to celebrate the 50th anniversary of Star Trek - but my skills with a paint brush are rather basic. So I spent some time browsing Pinterest until our pumpkins ere delivered. Then it all came together! 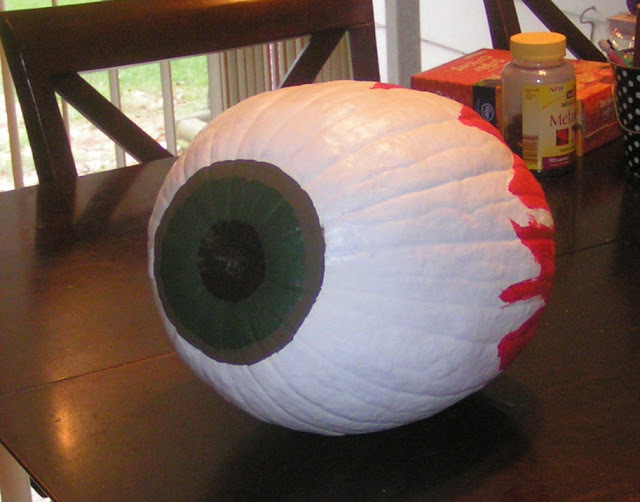 I saw one painted as a big eyeball and figured it wouldn't be too difficult. Then I really looked at Khloe's eyes when we were outside and wanted to try to replicate her color. After that, I dug out my paints and got to work. I had to work slowly, over a couple of days, to make sure the layers got dry...although I'm sure their are some cat hairs from a certain nosy kitty stuck in spots. The front turned out almost exactly how I'd imagined. The back is a bit messed up, but time ran out and it had to be turned in. And guess what! I won! One of the judges owns the local candy shop so the prizes were little bags of candy. I didn't get a picture, though, before I started tasting it all. Right now the eye is on the porch, watching for trouble and creeping out little kids as they walk to school. Sadly, though, its life will be short. Pumpkins don't last too long, so its destined for the garbage can. Then I can start gathering ideas for next year!